Take the test [...] you will then be matched with the fantasy or science fiction character that you have the most in common with. A strong presence who organizes efforts yet shuns consensus, you strive to educate others for the benefit of your causes. Don't center on your anxiety, Obi-Wan. Keep your concentration on the here and now where it belongs. 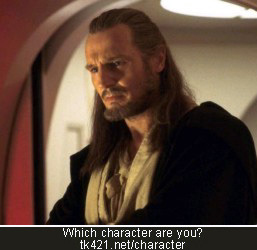 Qui-Gon is a character in the Star Wars universe. The Star Wars Databank has a character profile. And the fun part is... I don't even know the Star Wars universe!?!... Anyway, this got to me just like tag, from Adi Rusu, via Simona!